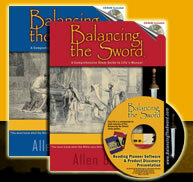 Balancing the Sword is a comprehensive study package that incorporates thousands of questions, tens of thousands of cross references, over a thousand illustrations, and over a thousand encouraging quotes, web support, and a flexible software for designing your reading schedule. The backbone of the Balancing the Sword curriculum follows a Q&A format. Thought provoking questions engage you which increases understanding, retention, and interest. Different than study guides which ask the reader how he or she feels about a passage, the questions and fill-in-the-blank sentences of Balancing the Sword are all objective in nature. Every question in Balancing the Sword is a text-dependent question, that is, each answer is found in the Bible chapter being read. Balancing the Sword helps you frame-up what the passage actually says leaving the interpretation to the Holy Spirit, you, and your spiritual leader: pastor, husband, teacher, parents, elder, or bishop. Each book is a Smythe-sewn, hardback with over 600 pages, over 3500 question, almost 27,000 cross references, over 500 images, and over 500 quotes. They robust books are designed to be used on a daily basis and to last for decades to come. Both Volume I and II of Balancing the Sword contain unique questions covering all 1,189 chapters of the Bible. See Table of Contents below. In total, there are an astounding 7,116 questions with 12,615 parts covering virtually all major points, literally every 2.7 verses. The number of questions and their distribution were determined using mathematical formulas analyzing the number of words in every book and chapter. Long chapters have many questions; shorter chapters have fewer questions. Not only do the stirring questions keep you focused on the actual message of the Text, but the questions also retain the rich titles used in that chapter. Prophecies, critical commands, and almost every Messianic passage are targeted to help you better understand and follow their biblical meanings and fulfillments. Answer keys provide the correct answer to each question, so there is little room for controversy within a group. Balancing the Sword provides tens of thousands of cross references (53,896 chapter references) to deepen your study and reduce time searching for connected passages. Over one thousand beautiful images are interlaced throughout the material illustrating biblical events, literal depictions, charts, and maps. The value of the workbooks is further enhanced by more than one thousand encouraging quotes found at the bottom of almost every page. The is additional writing space so you can journal your insights and questions. All questions are divided by chapter and by book allowing you to study an individual book or a complete section of Scripture. Balancing the Sword has the academic refinement suitable for advanced church groups and the intensely cerebral biblical queries. The material is strictly out of the Bible and is wonderful for group studies with any denomination. Balancing the Sword is designed to stimulate discussion and provide a framework for in depth learning of biblical principles critical to family success. Adding the BTS on-line software to the Balancing the Sword books gives you one of the most comprehensive Bible study packages available today. You are needed to make Balancing the Sword truly work as it was designed. Individuals can benefit on their own, but the greatest strength is enjoyed when the Text is expounded by a gifted teacher. View the table of contents for volume one and for volume two. Each book covers all 66 books or 1,189 chapters, as mentioned above. Balancing the Sword follows the traditional arrangement of English Bibles. Both books also include material on general abbreviations, ancient metrology (i.e., the study of measurements), key Bible verses, an answer key, biographical sketches on those quoted in the books (see Quotations above), an index of the people quoted, a bibliography of the quotes, and a bibliography of the images. View samples from Genesis (three pages from vol. 1), Judges (three pages from vol. 2), Matthew (four pages from vol. 2), and Revelation (three pages from vol. 1), and the Biographical Sketches (one page). Frequently Asked Questions (FAQ) about the Balancing the Sword books.